This is an advertisement for Heathman's fire escapes. At the start of the Victorian period most houses were lit by candles and oil lamps, unless carefully monitored these could be very dangerous and many Victorians lived in fear of a fire starting in their homes. In London there was a ‘Fire Engine Establishment’ from 1833, but there were many other fire brigades run by different insurance companies, which ran engines to put out fires in the properties that they insured. A blue plaque on the wall of your house signalled that you were insured, without a plaque the fire brigade would not put out the fire. 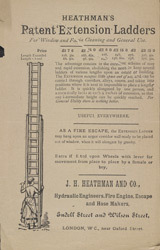 Safety equipment like ‘Heathman’s Window Escape’ would have been very popular.